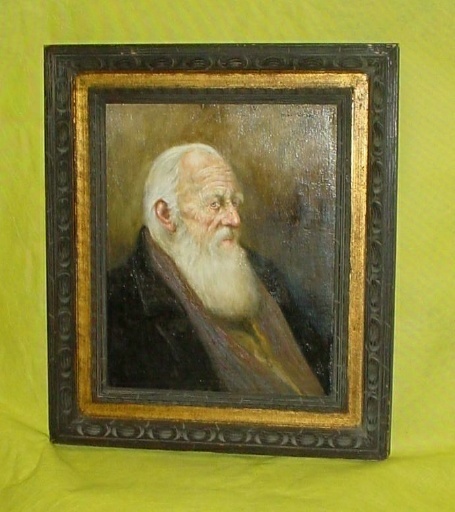 An Oil on Canvas Portrait of a Bearded old man, Signed UR “Dawley” (Joseph William Dawley ), Size of canvas 16" X 20". “A graduate of Southern Methodist University in Dallas, Texas, Joseph Dawley became well-known in the 1960s and 70s for his realistic character studies and landscapes. In 1975, he was diagnosed with Parkinson's Disease, and his style became much looser, more colorful, and impressionistic. Although raised and educated in Texas, Joe Dawley moved to New Jersey in the early 1960's where he remained. He painted in the traditional Old Masters style until 1982, when the symptoms of Parkinson's - diagnosed in 1975 - necessitated brain surgery. One of his accolades during that period was being commissioned to paint the official portrait of Mother Seton for the canonization in 1976. After the surgery and much recovery time, he found he had lost his fine motor skills needed to paint realism as he had. He taught himself impressionism and was very successful at it. He has appeared on all three major networks - ABC, NBC, and CBS - and was featured in "Life" magazine in June 1993. Today, after about 30 years of deterioration from the Parkinson's, Joe Dawley continues to paint in yet another style, much more abstract and definitely from the heart. He may not always be able to speak, remember names, or even walk, but he seems to always be able to paint.